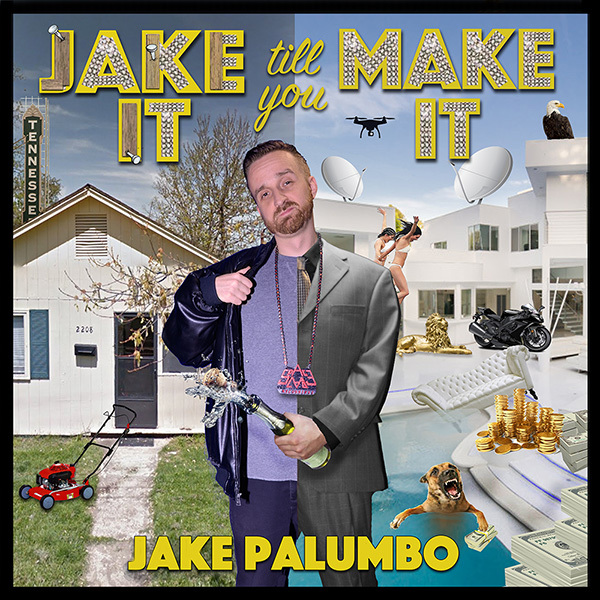 Friday, November 18th: Brooklyn, NY-by-way-of-Tennessee producer & emcee Jake Palumbo releases his 4th official solo effort via his independent label SpaceLAB Recordings – Jake It Till You Make It, a follow-up to 2014’s Curtain Jerker compilation, & his two previous studio albums Jobber To The Stars & District Selectman. While the album’s title hopefully inspires a laugh, the sentiments are neither ironic, nor sarcastic. An independent artist for over 10 years, & having worked at almost every level of the music industry – artist, producer, engineer, DJ, intern, studio manager, studio owner, & entrepreneur-by-necessity, the album is an idiosyncratic, snarky commentary on his unusual journey of patience, sticking to one’s mission, betting on long-shots & quite simply never giving up. Over a soundtrack that spans traditional boom-bap to spaced-out Southern melodies, Jake Palumbo delivers in a stream-of-consciousness rant style that seeks to “edutain” – sneaking it’s uplifting message in between multi-syllabic bars of imagination, hedonism & dark, matter-of-fact humor & inside jokes. The 16-track LP was Produced entirely by Jake Palumbo, & features guest appearances from Roc Marciano, Ras Kass, Ruste Juxx, Tek of Smif-N-Wessun, El Da Sensei, Shabaam Sahdeeq, El Gant, Innocent?, Sean Price (RIP), as well as the SpaceLAB Recordings roster – C-Zar Van Gogh, Ciphurphace, Gotham Heights, & Ollie OX. The 2nd single & music video “Exoskeleton” featuring Ruste Juxx & Tek, was released on November 15th, to positive reviews in the online hip-hop community. Visuals were directed by Megadon, who also handled the clip for the 1st single “Tuffalupagus” featuring C-Zar Van Gogh. Manilla Envelopes feat. Roc Marciano & Innocent? Next post Good News, Bad News: SpaceLAB is NOT closing…but we are moving.